Shotzy and Red Limited Print - Ithaca Gun Co.
“Shotzy and Red” Limited Edition Print – by Pat Gamby. Print is 25″x20″, image features Dave Dlubak’s (owner of Ithaca) very own hunting dogs. 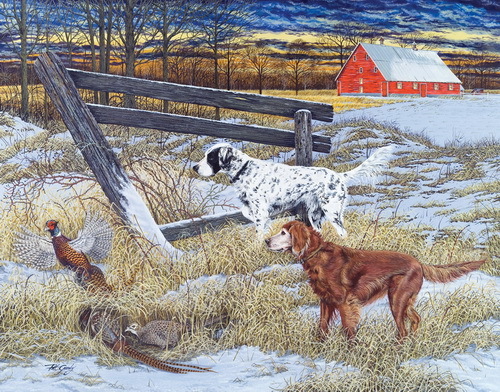 This print from a painting by Pat Gamby of Mount Victory, Ohio, is titled “Shotzy and Red”.It was commissioned for the cover art of the Ithaca Gun Company catalog and features a classic pheasant hunt scene with the company owner, Dave Dlubak’s very own hunting dogs.The print measures 25″ by 20″ with an image area of 22″ by 17″ and is produced as Giclee and printed on museum quality, acid free Hahnemuele Photo 100% paper. Each print in the 950 limited edition is numbered, titled, and signed personally by Pat Gamby. The print is wrapped in acid-free paper and shipped in cardboard tube packaging.